I'm sure most people have heard of the Dine-Out Vancouver, where many popular restaurants roll out a 3-course meal at a set price. The intention is attract customers who would normally be apprehensive in shelling out gobs of money on a restaurant they know little about. This way, the cost is fixed and the food serves as an introduction. Honestly, there are some hits and misses to this concept and if you pick the right restaurant (with a good menu), then it may very well turn into a good experience. Chose the wrong one and it may leave a bad taste in your mouth (figuratively and literally). 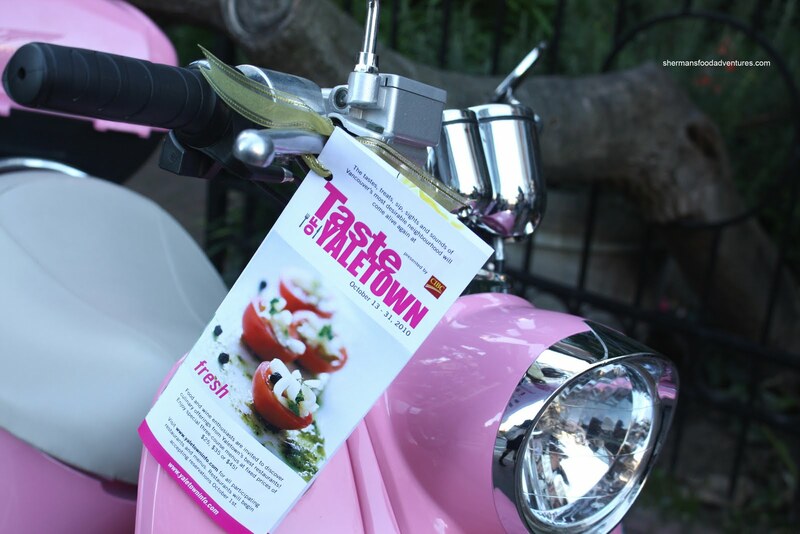 Unlike Dine-Out Vancouver, the Taste of Yaletown is not as big. Consider it a form of Dine-Out on a smaller and more concentrated scale. Specifically Yaletown restaurants, we find the same set meals at a reasonable price. If you were afraid to pay Yaletown prices on food you may or may not like, this is your chance to take some risks. As part of the media Dine-Out event, I was able to get a preview of 3 restaurants participating this year. We were supposed to meet at the Yaletown Business Improvement Office for the start of the tour. Somehow, a number of us got confused as to whe re it was located. Turns out it is a fairly non-descript place on Hamilton. There I met with Tara Thind from Omni TV. Also in our group was Carolyn Ali from the Georgia Straight and Sabine who writes Life Sparkles. Honestly, I didn't even pay much attention to the food as the company was interesting. 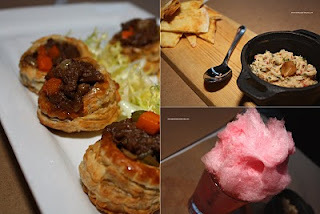 We started at Society and tried the Short Rib Pot Pie (Braised short ribs, seasonal vegetables & natural jus) and the Confit Albacore Tuna (olive oil, crostini, roasted garlic & frisee salad). We also got an interesting Pink Tom Collins topped with a large ball of cotton candy. 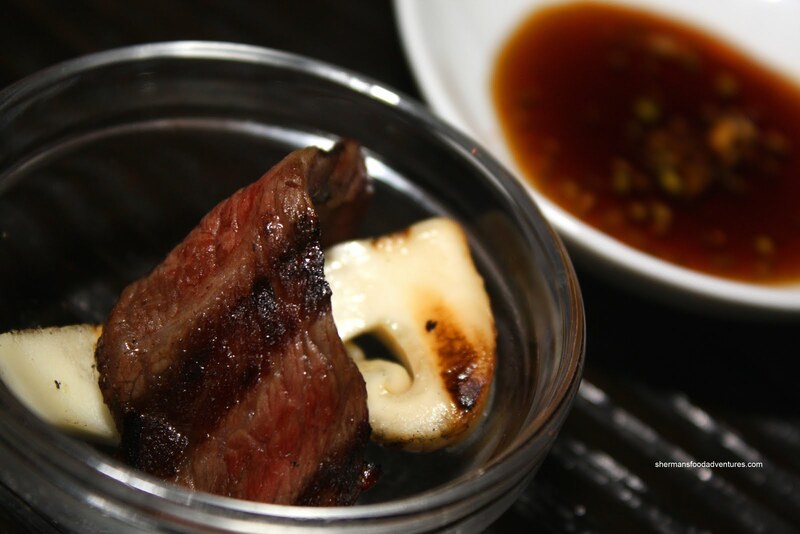 Next, we headed over to Hapa Izakaya and sampled only one item which was the Charcoal BBQ Wagyu Beef and Matsutaki Mushroom. Finally, we headed over to a relatively new place called Sweeney's. It used to be Soup Etc!. 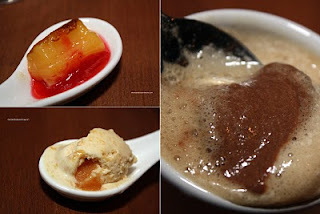 We sampled 3 dessert here including the Lemon Tart with Raspberry Coulis, Chocolate Mousse with Guinness Foam and a Deux Pêche Mode (Peach Tarte Tatin, served with a Peach Vanilla Ice Cream). A sweet ending to a quick tour. The Taste of Yaletown runs from October 13th - 31st, 2010. It will feature 25 of Yaletown’s restaurants with 3 course menus priced at $25, $35 and $45. Head to their website for more details: yaletowninfo.com.